IMIDER, Morocco — On a hilltop nearly 5,000 feet high in the Atlas Mountains here, a tiny outpost has taken shape over the past two years. The small stone buildings are decorated gaily with graffiti, and there is an open-air gallery. Many doors bear inspirational inscriptions from people like the Rev. Dr. Martin Luther King Jr. and Mother Teresa. On the dam of a nearby reservoir, someone has painted the face of a local activist, now in jail on what the locals regard as trumped-up charges. It is an unlikely spot for a settlement, but it was established with a purpose: to protest a mining company’s expropriation of precious water supplies, as well as the pollution that results from the mining. The inhabitants are drawn from the nearby municipality of Imider, 6,000 people scattered over seven villages and neighbor to the most productive silver mine in Africa. But while the area may be rich in silver, it is home to some of the poorest people in Morocco. The people of Imider (pronounced ee-me-DER) say they have grown to resent the mine because they get nothing from it except pollutants. So two years ago, some of them climbed up the hill and cut the water supply to the mine. 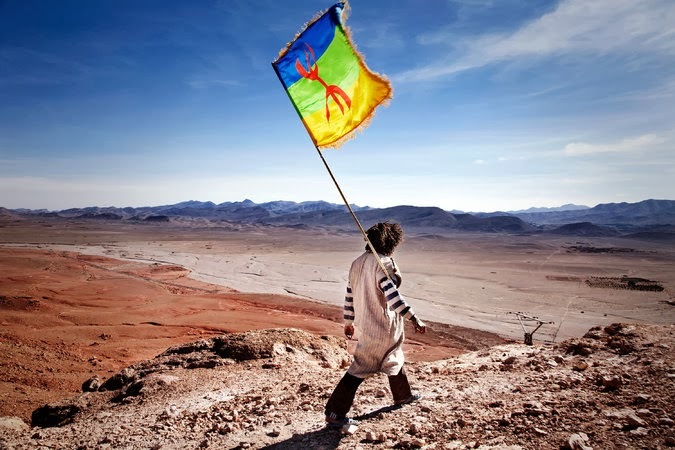 Since then, they have occupied the hill as they continue to fight the Imiter Mettalurgic Company and, by extension, the king of Morocco, its principal owner. These days, the hilltop, Mount Alebban, is relatively calm. Women come daily to cook in the little stone houses and participate in the regular strategy meetings that the villagers hold. In 2011, when the Arab revolutions led to the fall of dictators in Egypt and Tunisia, the Moroccan king, Mohammed VI, managed to stall the protests by offering constitutional overhauls that guaranteed more power to an elected government and more freedoms to Moroccans. But none of that has helped the people here. While for some, the conflict of Imider is mostly ideological, others say that it is not just about ordinary people rising up to make their lives better but also part of a larger problem that is echoed in conflicts with big mining companies across the globe. The occupation of the hill was set off in the summer of 2011 after students who were used to getting seasonal jobs were turned down. That led the other villagers — even those with jobs — to show solidarity and move to block the mine’s production abilities. One of the main demands of the villagers is that 75 percent of the jobs at the mine be allocated to their municipality. Exactly what is happening with the water is in dispute. The villagers say they want the company held responsible for environmental damage that they say is the cause of disease, livestock fatalities and desertification. The company categorically denies the townspeople’s accusations and says that an environmental impact study has proved that it is not contaminating the water supply or harming the environment. The company says that the mining was certified as meeting global environmental standards and that it has put in place irrigation systems for the farmers. Company officials say their processing capacity dropped 40 percent in 2012 and 30 percent in 2013, after the villagers cut off one source of their water. These days, they use another source in an effort to make up the loss. Mr. Hamdaoui said that despite having the king as the main shareholder, the company did not gain any special treatment from the government. He said the company was spending more than $1 million a year to build schools and to support community projects. Still, the activists who refer to themselves as the “Movement on the Way of 96,” a reference to a similar upheaval in 1996 that was crushed by the authorities, maintain that the company is in fact receiving favorable treatment from the state. The governor and other elected officials declined to comment on the dispute, which settled into a stalemate after negotiations broke down in November. After each meeting held at the foot of the hill, the villagers walk back home holding up three fingers — one for the Berber language, one for the land and one for mankind — hoping for someone to hear their call.